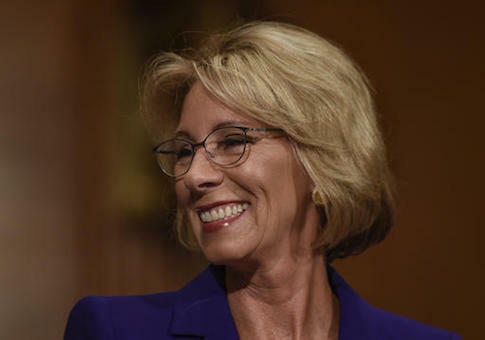 Betsy DeVos will serve as the new education secretary after Vice President Mike Pence cast a tie-breaking vote in the Senate. Tuesday’s vote was the first time in history that a vice president has been forced to cast a tie-breaking vote in a cabinet confirmation, a sign of the contentious confirmation process. DeVos, a leading advocate of education reform and school choice for decades, will now take the helm of the department, overseeing an agency that controls $70 billion in federal school funds and employs 4,400 people. DeVos is the chairman of the American Federation for Children, a school-choice advocacy group that has advanced school reforms and charter school expansion in states and cities across the country. While she lacked the public education credentials of previous Education Department leaders, such as Obama appointee Arne Duncan, DeVos was involved in the system when she and her husband founded a charter school in 2011. The Michigan Aviation Academy has since become one of the best schools in the state, becoming one of just 93 Michigan schools to earn a Silver Medal from the US News & World Report’s high school rankings. It was rated the 69th best school in the state, which had about 900 public and charter schools in the 2015-2016 school year. Democrats spent the 24 hours leading up to the vote staging a marathon protest against DeVos’s candidacy highlighting their opposition to her advocacy on behalf of charter schools and school vouchers to help students leave failing public schools. The overnight protest session was the culmination of a weeks-long opposition campaign waged by teachers’ unions and labor activists. Union leaders made a last-minute pitch to oppose the candidacy. National Education Association president Lily Eskelsen Garcia took to MSNBC on Tuesday morning to say she was "appalled" by DeVos’s support for school choice. She warned senators that "a whole lot of people are watching" the vote. "She turned public school dollars over to for-profit businesses," she said. "She would be a disaster as our secretary of education. And there’s a whole lot of senators now who understand that a whole lot of people are watching." Education reform supporters praised the confirmation. Denisha Merriweather nearly dropped out of school before receiving a voucher under Florida’s scholarship program. She went on to graduate from college and has become a proponent of reform. Merriweather said in a statement that she hopes to see DeVos put similar programs in action nationwide. "We have thrown more money at this problem to no avail for too long. Now it’s time to move forward with an education reform agenda rooted in school choice and local control of education," she said in a statement. "Betsy DeVos’s confirmation is a great victory for parents and students, especially the at-risk children who have been stuck in some of the nation’s worst schools." DeVos cleared the Senate Health, Education, Labor, and Pensions Committee without a single Democratic vote. The nomination appeared to be in jeopardy after two Republicans, Senators Lisa Murkowski (R., Alaska) and Susan Collins (R., Maine), announced they would oppose the nomination just days before the vote took place. Both of those GOP senators have received thousands of dollars from teachers’ unions. Democrats needed just one more Republican defection to block the nomination, but Senate Majority Leader Mitch McConnell was able to wrangle the remaining Republican senators to vote for DeVos. The DeVos fight could be a preview of more contentious nominations moving forward. Nearly every Democrat has pledged to oppose all of Trump’s remaining nominations to the cabinet with only blue dog West Virginia Senator Joe Manchin indicating he would be willing to break with his party on any of the remaining nominations. "If not total unanimity, we’re going to have near Democratic unity in opposing the remaining nominees for President Trump’s Cabinet. This unity makes clear just how bad this Cabinet would be for America’s middle class," Schumer told the Washington Post. DeVos is the seventh Trump cabinet appointee to be confirmed by the Senate. She will succeed acting Secretary of Education Phil Rosenfelt. This entry was posted in Issues and tagged Betsy DeVos. Bookmark the permalink.